When I was young, my mom, who is from Texas, used to make fried Okra. I loved it. Like most things otherwise considered nasty, Mom would get us to eat it by smothering it with sauce. i.e. broccoli and cauliflower always came smothered in melted cheese, cooked spinach always came with a hefty dose of a yummy pepper vinegar sauce. Liver was always buried under a pile of sautéed onions (this one never worked though. It’s liver after all…). Okra was no different, and being a good Texas girl, Mom kept to her roots even while raising her family in California. She’d slice it really thin, dip it in egg, then in corn meal, and fry it in oil. (My grandmother used Crisco ’cause “they didn’t know any better back then”). Then you serve it with ketchup. Simple. So – being here in Louisiana, I asked Sandy about getting us some good Southern Fried Okra. I had some with Kim in North Carolina, but I think they use flour instead of corn meal. Sandy had NEVER had it (and frankly wasn’t very excited about the prospect)! So I told her about my mom’s yummy recipe. We called my mom and got the instructions. First you slice it into really thin pinwheels, quarter of an inch or less. Then you dip it in egg, followed by cornmeal. Fry it in hot oil until very crisp. Serve with ketchup. This takes all the sliminess out of it. So here I am the Texas to California transplant teaching my dear England to California to Hawaii to Louisiana transplant friend how to cook good Southern Fried Okra. To make it fun, we called our friend Roy… the same one who took the photos of Sandy’s house. Roy was born and raised in Louisiana, not far from here, transplanted to California, then back to Austin, Texas. Not only is Roy a great photographer, but he’s known back home in California as a world-class chef. Roy, of all people should know how to cook fried Okra. So we called him. Notice the cell phones on the counter while Sandy and I are cooking. Turns out Roy HATES Okra. (See yesterday’s sermon about hate, dear Roy). His mom had tried to get him to eat it in some kind of soup and it was slimy and yucky. Won’t touch the stuff. Sandy had a similar experience when her mom was out of town and left Sandy and her sister with some canned food, including a can of slimy okra to eat. Poor poor dears. They didn’t have MY Texas mother to fry it up nice and crisp for them. We followed Mom’s recipe, and sho ‘nuf, turned out great. Everyone loved it. Some went back for seconds. Only thing we would change would be to add more seasoning to the egg or corn meal for flavor. Crunchy and delicious. I just love being right. I’m with Roy this one dear Fawn. My father tried to deliver us – to no avail. Even your lovely mother’s (hi Ms Gilmore!) recipe could not rescue okra from its slimy bitterness in my mind (or mouth!). Shucks. Shoulda cooked you up some okra done right when I was there. You will eat it and you will like it. Understood? The best part about the fried okra was listening to Fawn and her Mom, Fran, discuss the okra frying strategy while I drove the Element on our fresh okra finding quest. Second best part was talking & laughing with our friend (and food consultant) Roy amidst dinner prep activity. I was proud of myself that I dared to try okra again without having it disguised in a delicious gumbo. It was good. Not great. I’d make it again but with more seasoning, as Fawn wrote earlier, and maybe bigger slices so there’s less crunchy cornmeal enveloping the little green guys. No slime though. I’m all for that. The okra nicely complemented the outstanding homegrown (thank you Paula Luther) tomatoes on our dinner plates. Deep red succulent goodness topped with a tad of lumpy bleu cheese dressing. Oh my. I did forget to mention those delicious tomatoes. There’s nothing like fresh home-grown ones. Hopefully when I get back home, mine will be ready for picking. Thanks for taking a risk and trying the okra. Seeeee Roy & Kimmie?! It can be done. I have tried it. 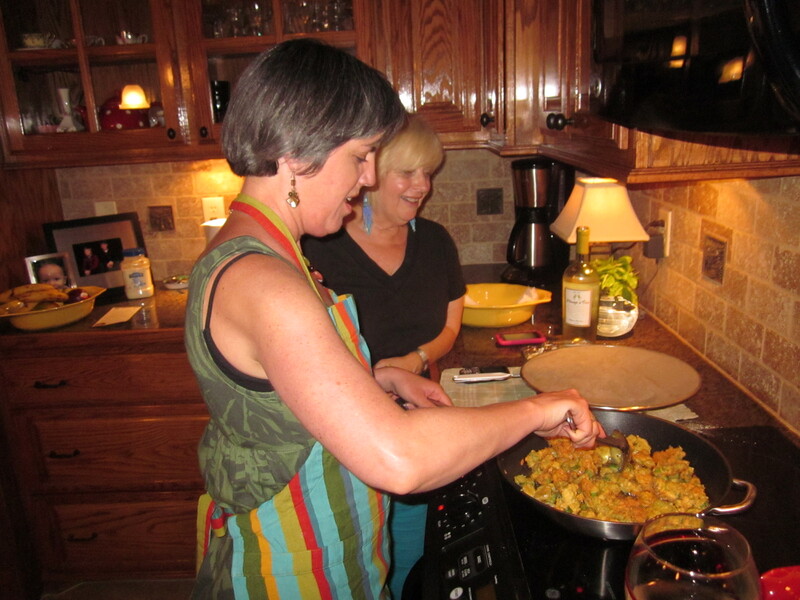 You think my dad (from GA) didn’t know how to make fried okra (and fried green tomatoes)?! Just because you can fry something – doesn’t mean you should! Sounds amazing. One of my favorite foods! The best part is having fun while cooking and eating it. Now I’m gonna make some for dinner. Thanks for the idea.